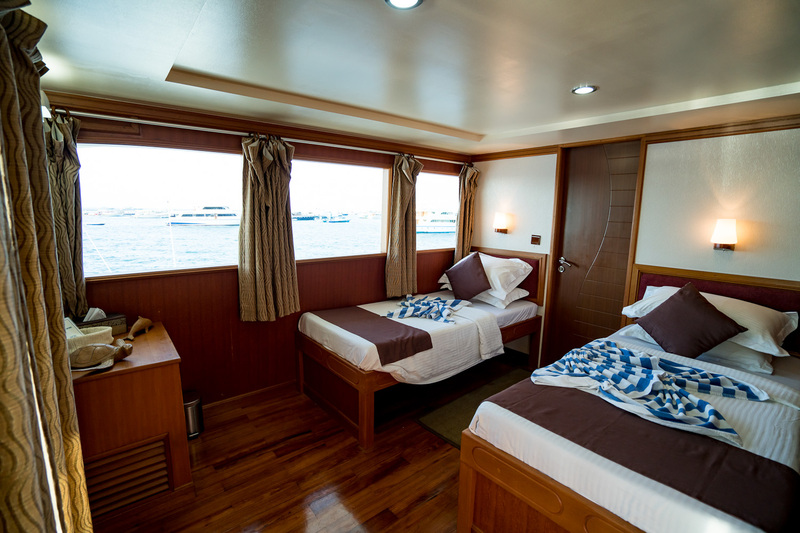 Duke of York Maldives liveaboard diving - Book now ! The Duke of York was built and launched in the Maldives in 2010. Thanks to high design standards, combining the skills of local naval architects and engineers and quality standards, this yacht is the ideal solution for a fantastic sea adventure in the Maldives that is also a holiday dedicated to wellness and relaxation in a comfortable environment. 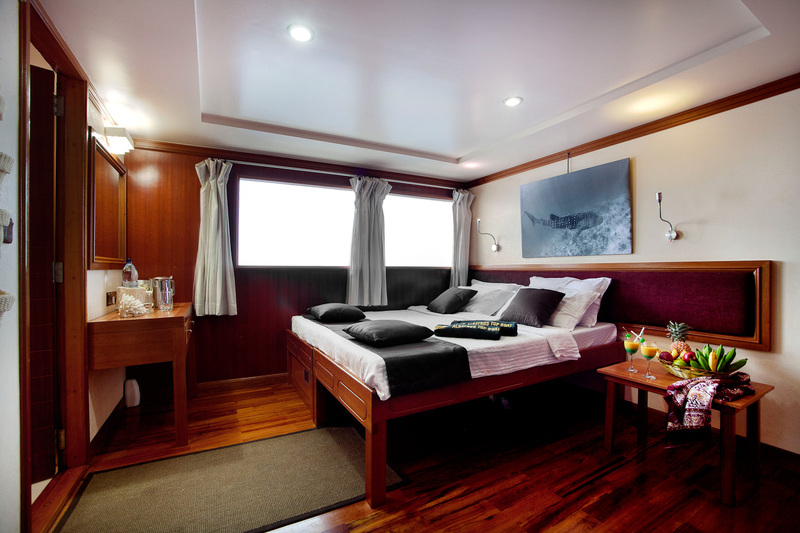 With 11 Cabins the Duke of York accommodates up to 21 guests comfortably in 1 double with twin beds with wide glass window overlooking the stern of the second deck, 1 double with convertible twin beds (on the second deck), 1 double with twin beds (on the second deck), 4 triples (one double bed and a single one), 3 doubles with twin beds and 1 single cabin. 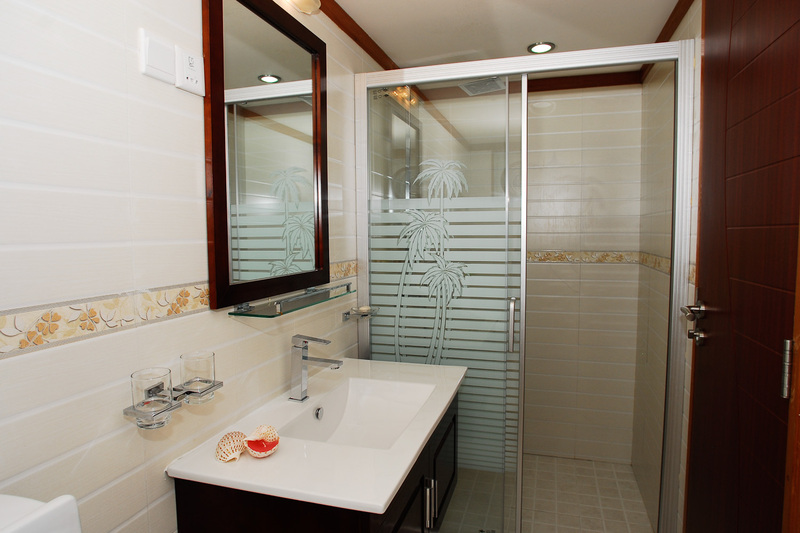 All cabins feature independently adjustable air conditioning, bathrooms with shower. The 36-meters long and 11-meters wide Duke of York boasts 4 levels with indoor parquet flooring and teak on the main deck, is accompanied by a comfortable dhoni used for diving, snorkeling, fishing, marine activities and to land on sand banks/desert islands. Along with the more traditional diving techniques we are able to offer cruises with the assistance and material to dive with rebreathers. Onboard NITROX is free of charge. Fees for desert & touristic islands when requested. If you wish to have the cabin to yourself, the single cabin supplement is +80% on top of the individual rate. Non diver receives a discount of US$80 per week. 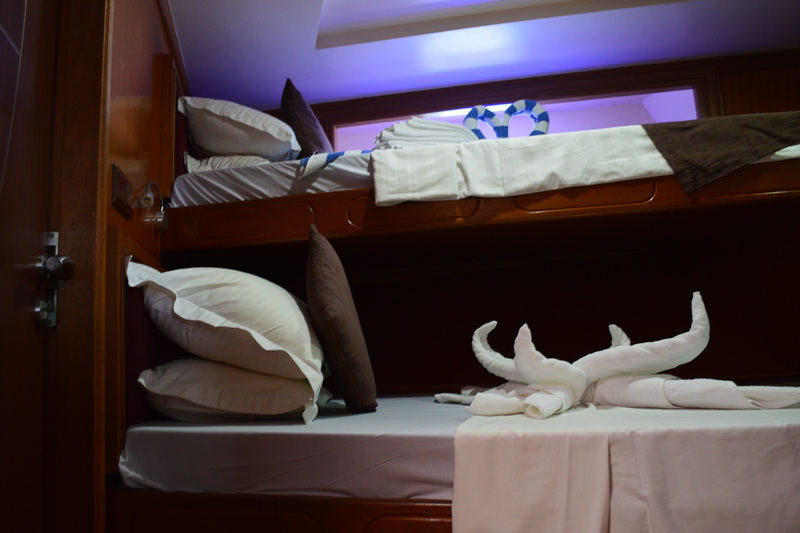 Children (from 2 – 11 yo) sharing a cabin with 2 adults pay only US$400 – diving is not included. For a group of 10 paying group, the boat offers 1 space free of charge (FOC). For full charter (based on 16 people) the group will receive 2 free spaces (FOC) so 14 paying + 2 FOC. 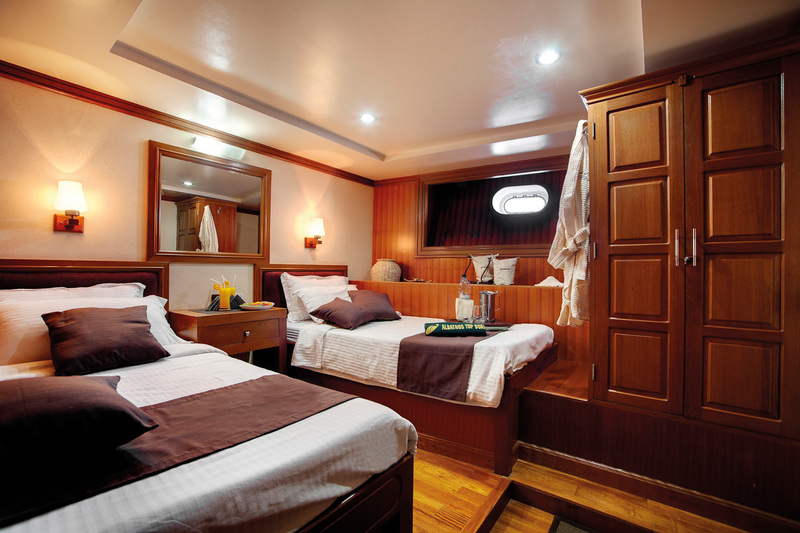 With 11 Cabins the Duke of York accommodates up to 21 guests comfortably in 1 double with twin beds with wide glass window overlooking the stern of the second deck, 1 double with convertible twin beds (on the second deck), 1 double with twin beds (on the second deck), 4 triples (one double bed and a single one), 3 doubles with twin beds and 1 single cabin. 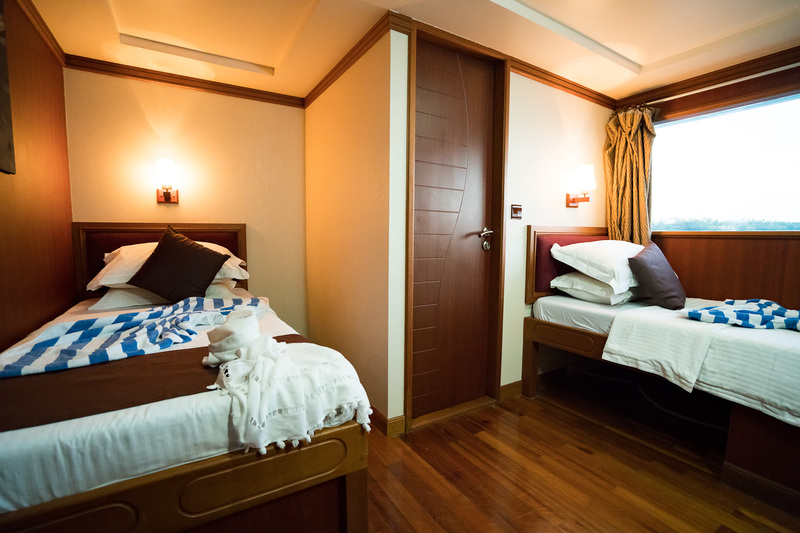 All cabins feature independently adjustable air conditioning, bathrooms with shower. Our professional Diving Team has a long experience and the necessary instruments to take you to the best spots of these enchanted places. Dive Masters, Ali and Rasheed, have been working with us for more than 20 years. Be prepared to experience a lot of action with the savvy guides of Conte Max. The boat-leader will explain to you all the varieties and choices offered on the liveaboard cruise; you will be free to choose the right one for you. The itineraries will be custom made (weather allowing) according to guests expectations. Fuel tank capacity: 8000 lt. The embarkation time is usually in the morning, but it also depends on the arrival of the international flights of the guests. Ideally you should aim to arrive early morning or before 10 am on the first day of the trip. It is also recommended to arrive one day early and stay on the airport atoll (HulhuMale – NOT Male), there are a mixture of hotels and guest houses to choose from so please check booking.com and search for Hulhumale. Your hotel / guest house will then deliver you back to the airport the following day (the day of departure) where you will be met by the boats representatives at airport arrivals and taken directly to the ship which is anchored offshore near the airport, you will journey over on the dhoni (the boats 15m dive boat) to join the main ship. Please check with your hotel to see if there is any charge for this transfer as some offer it for free and some charge for this service. This is the only meeting point for the boat pick up, it is not possible to pick guests up at their respective hotels if you arrive early due to the distances involved between atolls and the time involved. The checkout time is at 8 am on the last day of the cruise. Guests will be in the airport by 8:30 am accordingly. The day before there are only 2 dives ending around lunchtime so you may fly out in the late morning and still have the requisite no fly time required – Always refer to your dive computer for this but PADI recommends 18 hours.